“Death Note” is a Japanese manga, anime, live-action movie series created by writer Tsugumi Ohba and manga artist Takeshi Obata. Not only in Japan, is it known by manga and anime fans in all over the world. 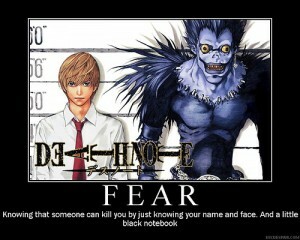 What makes it so popular is the suspenseful story involving a supernatural notebook called “Death Note”. When the user of the notebook writes someone’s name, the person dies. The main character, Light uses Death Note to kill criminals, however, a mysterious detective L tries to hold Light in check. The complex mind game between Light and L is thrilling. Also the relationship between Light and a punk looking death god, Ryuk is interesting. Fancy One of Those? Square Watermelon from Japan! !